It’s been a while since I shared a slow cooker recipe. 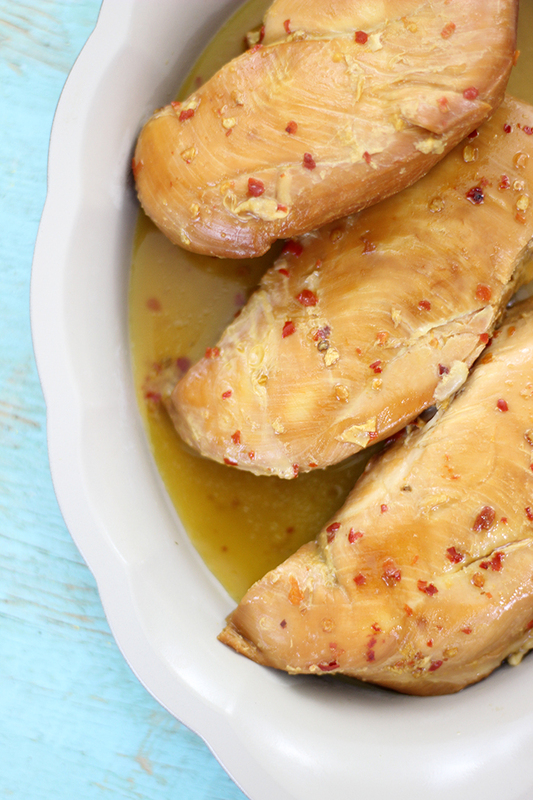 This sweet and spicy citrus chicken is another super easy recipe to add to your cooking to-do list. It’s so easy, it’s almost mind blowing. It comes together with just a few all natural ingredients that I think you’ll love. Well, my husband does and that says a lot since he’s such a picky eater. I kid not. This is a sponsored post with Noble Juice, all opinions are my own. 100% Tangerine Juice by Noble Juice makes this recipe so easy. Just adding a cup of their fresh juice packs a lot of punch. I also added a bit of honey for an extra hint of sweet flavor to compliment the citrus. Then, I chose red pepper flakes to add a spicy kick. The combination of sweet and spicy gives this chicken a ton of flavor even though there are just a few ingredients. Whisk together the juice, honey and crushed pepper. 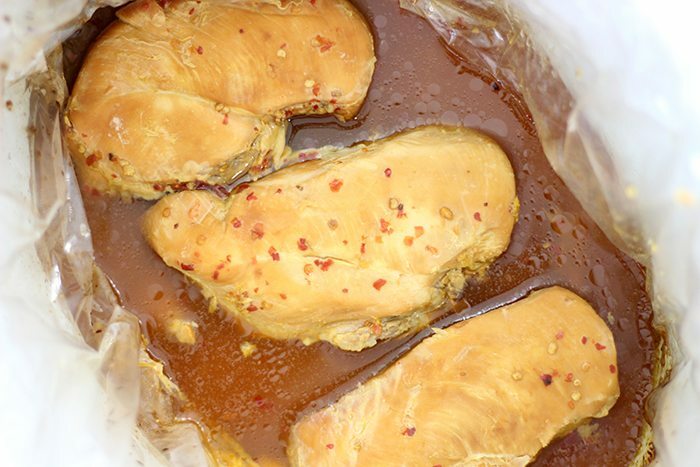 Place the boneless chicken breast in the slow cooker and pour the mixture over the top. Cook on high until cooked through (for 3.5-4 hours or low for 6-7 hours). Making tasty food doesn’t have to be complicated, so I’ve learned. Leaning on my slow cooker has been one of the most amazing things to happen to dinner around here. Hope you enjoy this easy idea! 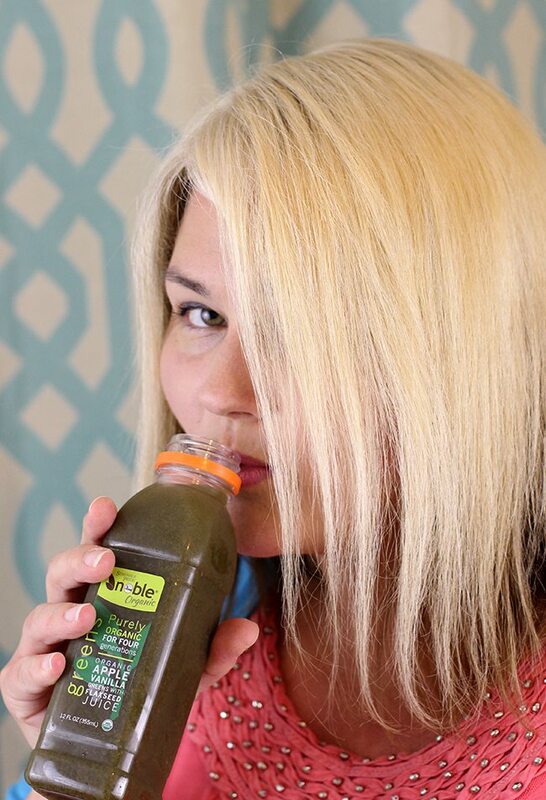 Speaking of amazing, have you been able to try Noble Juice yet? I’ve been sharing yummy recipe ideas using their fresh Florida grown juices. Keep an eye our for some of their really unique juice blends next time you’re grocery shopping. Choose from delicious options like Organic Mint Lemonade with Aloe, Organic Apple Vanilla Greens with Flaxseed Juice or Honeybell Blueberry Juice. Sounds so good, right? This rice pairs up perfectly with my simple savory citrus rice too. So pick up a big bottle of that Tangerine Juice and get to cooking! 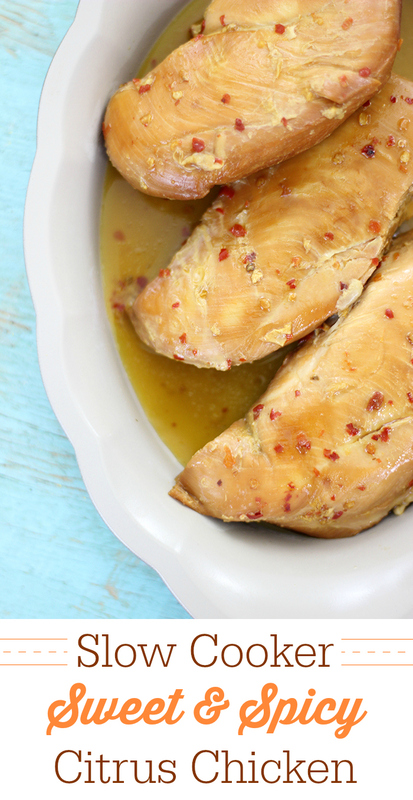 Have you ever made a citrus flavored chicken? Share your recipes! That looks great! A good meal for any night of the week. I've never tried Noble Juice - but it sounds and looks amazing! And that recipe is seriously making me drool! This makes me wish that I didn't get rid of my slow cooker! I will have to see how I can make it without it because now I am craving it! I think I would die without my slow cooker. LOL! All kidding aside I'm sure you could use a meat thermometer to time this in the oven also. I love slow cooker recipes. They make the chaotic dinner hour a lot less crazy. Looks delicious! This is one of my favorite ways to cook chicken- and I bet it would be delicious for a ham steak (Easter) too! I love the vibrant flavors and minimal effort. I think I'd add just a few slices of pineapple. I'll have to keep an eye out for Noble juices near me! OOh pineapple sounds yummy too! Great idea!